Sweet Water Trade Moorings is a minor waterways place minor waterways place place on the waterways major waterways place village town city on the Lee and Stort Navigation (River Lee: commercial section) between Hertford Union Canal Junction (Junction of Hertford Union Canal and River Lee) (¼ furlongs to the southeast) and Cheshunt Marsh Footbridge No 44 (11 miles and 2¾ furlongs and 7 locks to the north). The nearest place in the direction of Cheshunt Marsh Footbridge No 44 is White Post Lane Bridge No 11; ¼ furlongs away. Queen Elizabeth Olympic Park, London, E20 2ZQ — 866 yards to the east. Islamabad — 1577 yards to the southwest. 8 Queen's Yard, London, E9 5EN — 165 yards to the northwest. London, E20 1 — 507 yards to the east. London — 1223 yards to the south. Westfield Stratford, London, E20 1EL — 1137 yards to the east. London — 1267 yards to the southeast. London — 1486 yards to the southwest. 98C Wallis Road, Main Yard, Hackney Wick, London, E9 5LN — 172 yards to the north. Queen Elizabeth Olympic Park, London, E20 2ST — 474 yards to the southeast. London Stadium, Queen Elizabeth Olympic Park, London, E20 2ST — 585 yards to the southeast. London, E13 9AZ — 605 yards to the southeast. 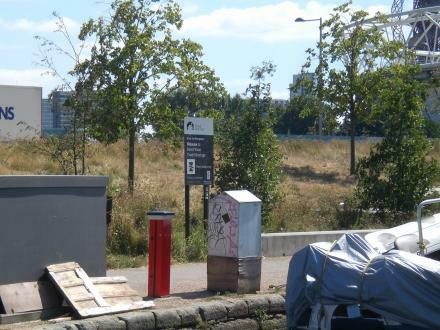 Olympic Park , Stratford, London, E20 2ST — 568 yards to the southeast. Stratford, London, E15 2 — 1005 yards to the east. stratford, Toronto, E20 2ST — 293 yards to the east. Queen Elizabeth Olympic Park, London, E20 3AD — 1359 yards to the north. Northern Retail Lifeline, London — 1171 yards to the northeast. Abercrombie Road, Queen Elizabeth Olympic Park, London, E20 3AB — 1052 yards to the northeast. Queens Yard, White Post Lane, London, E9 5EN — 98 yards to the northwest. 21 Station St, London, E15 1AZ — 1383 yards to the east. Stratford — 1027 yards to the northeast. Bow — 1264 yards to the southwest. River Lee, White post lane, Hackney Wick, London, E9 5EN — 51 yards to the southeast. Fairfield Rd Unit B, London, E3 2 — 1351 yards to the south. Queen Elizabeth Olympic Park, London, E20 2ST — 925 yards to the southeast. London, E20 3HB — 267 yards to the northeast. London, E9 5 — 130 yards to the west. International Way, London, E20 1 — 1008 yards to the east. London — 1119 yards to the south. London — 1448 yards to the southwest. 788 yards to the north. London, E3 2 — 375 yards to the south. London, E3 2 — 1631 yards to the south. London, E15 2 — 1013 yards to the northeast. E20 — 1184 yards to the northeast. 90 Main yard, Wallis Road, hackney Wick, London, E9 5LN — 259 yards to the north. London — 1121 yards to the east. London — 1250 yards to the east. 2 Stratford Place, London, E20 1EJ — 1072 yards to the east. 92 White Post lane, Schwartz Wharf, building 4, London, E9 5EN — 135 yards to the west. Queen Elizabeth Olympic Park, London, E20 3HB — 257 yards to the north. Corner of Honour Lea Avenue & Sunrise Close, London, E15 2ER — 1250 yards to the northeast. Queen Elizabeth Olympic Park, London, E20 2AD — 797 yards to the southeast. Westfield, London, CR9 4 — 1198 yards to the east. 54A Broadway, London, E15 1NG — 1635 yards to the east. 1520 yards to the southeast.